Rosacea is a hard condition to live with. Warm weather, sunshine, artificial lighting, stress, laying down, bending, exercising – all can trigger the flushing, swelling, burning, and pain from Rosacea. This makes every aspect of life a daily struggle. What if there was a completely natural and effective way to relieve Rosacea symptoms? It’s time to discover red light therapy for Rosacea. In this post, you’ll find how this natural, non-invasive and proven light treatment can significantly relieve your Rosacea symptoms (especially for mild to moderate cases) and help you get your life back. Low-Level Laser Therapy is your red light at the end of the tunnel. 1 Improve Skin Healing by 200 Percent? 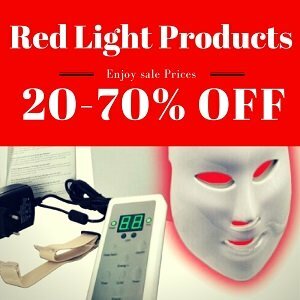 2 How Does Red Light Help with Rosacea? 4 Is Red Light Therapy Scientifically Proven to Work? 4.1 What’s the Right Red Light Wavelength for Rosacea? 4.2 How Long is Treatment Time? 4.3 How Long Until I See Results? 4.4 Is Red Light Therapy Safe for Rosacea? Improve Skin Healing by 200 Percent? 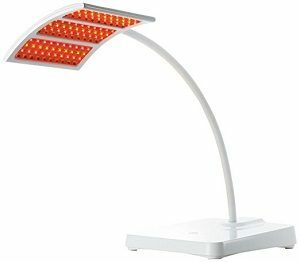 Red light therapy involves exposing your skin to strong sources of visible red light (610-700nm), usually through LED bulbs. The book “Light Years Ahead” has collected many studies showing that visible red light (in the range of 630 nm to 700nm) can boost the skin’s healing rate by 200 percent. 1. LLLT was proven many times to naturally reduce inflammation and pain. When you control inflammation, it reduces swelling, redness, itching, and pain. 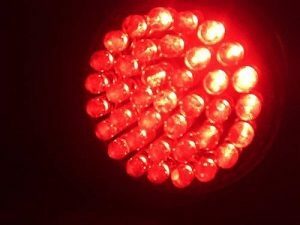 How Does Red Light Help with Rosacea? 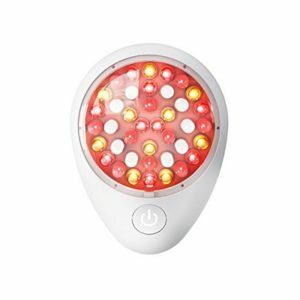 Visible red light from a high quality and powerful LED device can penetrate your skin to a depth of about 8-10 mm. When the red light wavelength reaches your skin affected by Rosacea, the skin cells absorbs it and it results in increased microcirculation. More blood comes rushing in, bringing more healing nutrients and more oxygen to the exposed area, which accelerates the healing and rebuilding ability of the cells. 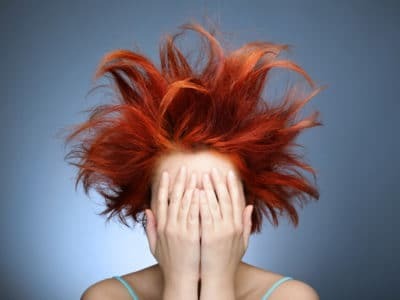 The flushing, swelling, bumps, pain, and sensitivity to triggers – are noticeably relieved – without medication and topical creams (which only trigger more flare-ups). What about the broken capillaries? Red light therapy is very effective for broken capillaries around the nose and on the cheeks as well. 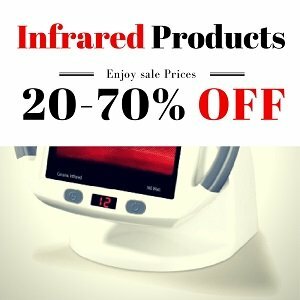 How to Choose the Best Red Light Therapy Home Device for Rosacea? 1. Do you need a handheld device or a large 2-panel device? A large red light therapy system can cover your entire face in one treatment, but if your Rosacea is located only around your cheeks, you may not need it. If you need to travel with your device, you’ll need a handheld device. 2. How much will you be able to spend? Red light home treatment for Rosacea depends a lot on your patience and consistency. You’ll have to treat yourself every day for at least a few minutes to see results and keep them. This tabletop home device has amber light therapy as well. Many people with Rosacea find that their skin responds well to this wavelength, especially when used with red light therapy as well. I recommend avoiding battery operated products because the batteries cause power strength to decrease gradually, plus they are an unnecessary expense. Is Red Light Therapy Scientifically Proven to Work? NASA sent their LED red light therapy devices into space and studied their value for various forms of healing and treatment. Note: there are only a few studies about the specific impact of red light therapy on Rosacea. There are many studies proving red light ability to reduce skin inflammation and boost skin healing – both are relevant in managing Rosacea. What’s the Right Red Light Wavelength for Rosacea? The absolute optimal spectrum ranges are 610-625nm & 660-690nm. The absolute optimal single wavelengths are 660nm and 680nm. “Basic rule is yellow LED for mild redness, red LED for more inflamed rosacea, combination of red and near-infrared for inflammation and swelling”. Most home red light therapy devices (advertised for acne) will have these exact light waves. Treatment time is 3 – 5 minutes per area. Depending on the size of the treatment head in your home device, it can take about 20 minutes to cover the entire face. 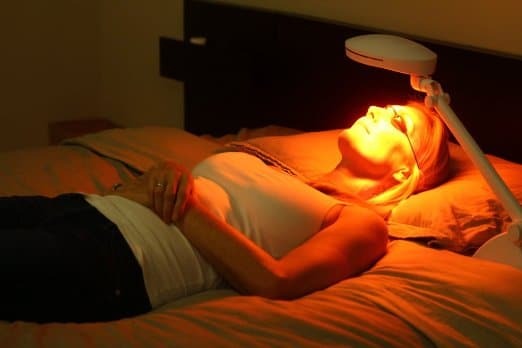 👉 If you use a tabletop red light therapy device, like this one, you can cover the entire face in 5 minutes. Note that it is not recommended to apply heat on the head area for more than 10 minutes. Results will be seen depending on your skin’s reaction to red light therapy and the severity of your symptoms. Some people feel immediate relief in pain, itching, redness (erythema) and inflammation, and for others, it takes longer. Two weeks seems to be the average, but only if the LED home treatment is consistent (once every day or every couple of days). After 4 weeks, you can expect a noticeable improvement in Rosacea symptoms. Is Red Light Therapy Safe for Rosacea? Can it be used with Oral and Topical Medication? Red LED light therapy is generally safe for Rosacea treatment and can be used along with the majority of medications. Since there’s a wide range of medication for Rosacea, please consult your doctor to make sure the combination is safe. Any time you use red light therapy, please wear protective eye goggles, like these ones. Note: The heat from the LLLT device may cause some redness at first, which disappears later. Some topical medications can cause light sensitivity (for example Metrocream/Metrogel). That’s why you have to use light therapy on clean skin. Apply your topical treatment only after the red light treatment. After finishing your home red light rosacea treatment, we recommend using this cream to help speed up your results. The Puriya all-natural cream for rosacea, psoriasis eczema and rashes (with the powerful Amaranth oil) can provide instant relief from itching and pain and is perfect for post red light treatment. Even though Rosacea is claimed to be an incurable disease, I certainly hope that you don’t give up the battle. Red light therapy home treatments are proven safe and effective, though the effect is different for each person. I’ve shown you how exactly to use LLLT as a natural treatment for Rosacea, including the best home devices for it. I sincerely hope that this information helps you and other people. See more about the proven skin benefits of red light therapy. If you have any questions or comments, please share them with us in the comments below. Red light therapy is extremely useful for rosacea treatment. In this article you say: “Note that it is not recommended to apply heat on the head area for more than 10 minutes.”. You say you can use it up to 20 minutes a day. Red LED light is does not get very heated. It’s a different wavelength than the infrared – which is invisible light experienced as heat. I hope this clears things up. Nice article! My friend is dealing with rosacea and this device can be effective treatment. I will definitely share this article with her. Thanks a lot for sharing.